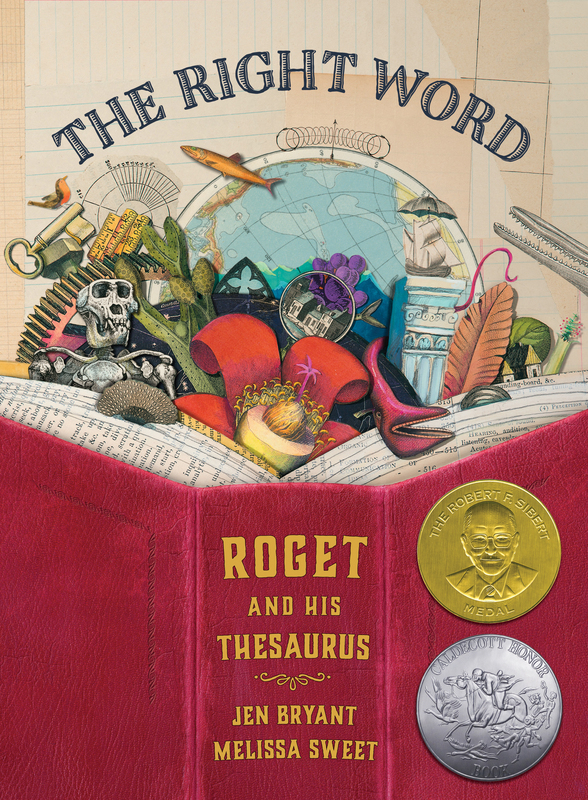 Jen Bryant has authored a number of acclaimed picture books for children, including the A River of Words: The Story of William Carlos Williams and, new this month, The Right Word: Roget and His Thesaurus (both illustrated by Melissa Sweet). Question: In addition to being the authors of famous literary works, what do William Carlos Williams, Peter Mark Roget, Anton Chekov, John Keats, and Sir Arthur Conan Doyle have in common? Give up? Answer: They were all physicians. In the course of researching and writing A River of Words: The Story of William Carlos Williams (EBYR, 2008, illustrated by Melissa Sweet) and The Right Word: Roget and His Thesaurus (EBYR, 2014, also illustrated by Sweet) I began to think more deeply about the connection between these professions. As someone who struggles, even as a full-time writer, to carve out time for creative work, I found it fascinating that both men managed to be prolific writers despite having a family and very demanding full-time job. I also wondered: if they lived today, would they be able to do the same? Luckily for us, Peter Mark Roget (1779-1869) and, more recently, William Carlos Williams (1883-1963), lived at a time when mastering medicine AND literature seemed more plausible. And not only plausible, but desirable: their mastery of one undeniably increased and enhanced their capability in the other. This makes sense if you stop to think about it: before they had access to sophisticated X-rays and blood tests, DNA analysis, MRIs and CAT scans, physicians relied almost exclusively on their powers of observation in order to heal the sick and the injured. Their ability to correctly diagnose and treat an illness rested largely on their skill in picking out small discrepancies in otherwise normal human function. This way of “seeing” and perceiving what others usually missed (Williams’s poems grew out of simple, ordinary things such as plums, sparrows, and wheelbarrows), of recognizing connections between seemingly unrelated things (Roget published one of the first public health pamphlets, putting forth a then-new idea of better hygiene as a way to reduce disease), and to discern patterns (Roget’s observation of carriage wheels appearing to bend when seen through Venetian blinds became a basic principal of motion pictures) was as critical to the poet (Williams) and to the naturalist/linguist (Roget) as it was to the physician (both). And so was communication, the success of which rested largely on their verbal arsenals. “Where does it hurt?” My tummy. “Is it here — or here?” There. “Is it sharp pains, like someone is poking you, or is it dull, like there’s a rock inside?” . . . and so on, as Williams might converse with a child patient. In the case of Roget, whose obsession with word lists began at age eight, formal medical training, as well as decades of treating the poor in his free clinic, amplified and expanded his already enormous (and multilingual) storehouse of words and phrases. His Thesaurus entry for Physical Pain , for example, includes everything from the general ache, affliction, soreness, malaise and gripe to the (painfully!) specific lumbago, sciatica, convulsion, colic, gout, and vivisection. I can hardly imagine what my own writing life would be like without the clean, precise lines of Williams’s “The Red Wheelbarrow” or the expansive treasure house of Roget’s Thesaurus. But now I understand that in no small way, these masterworks were informed by their authors’ proximity to pestilence. How about you? What are your thoughts on how modern life has affected our powers of observation? Have you read anything lately by an author who’s also a physician? What other non-literary professions lend themselves most readily to the writing life? Click to visit Jen Bryant’s website or blog, or to order The Right Word: Roget and His Thesaurus.